Sea Urchins cottage was built in 2016 to an excellent specification. Downstairs there is a porch and large entrance hall with cloakroom/wc, leading through to a generous open plan lounge/dining/kitchen area. Double patio doors lead onto the garden with outdoor seating and sea view. Upstairs there are two bedrooms. The master has a king-size bed, a balcony with amazing sea views, and ensuite bathroom. The second bedroom can be made up as either two small singles or a kingsize bed with a large ensuite shower room. We provide a further camp bed (preferably for children only) with bedding, which fits in either bedroom depending on your preference. There is also a travel cot for an infant if needed. Outside there is a lawned area and parking bay for two cars. 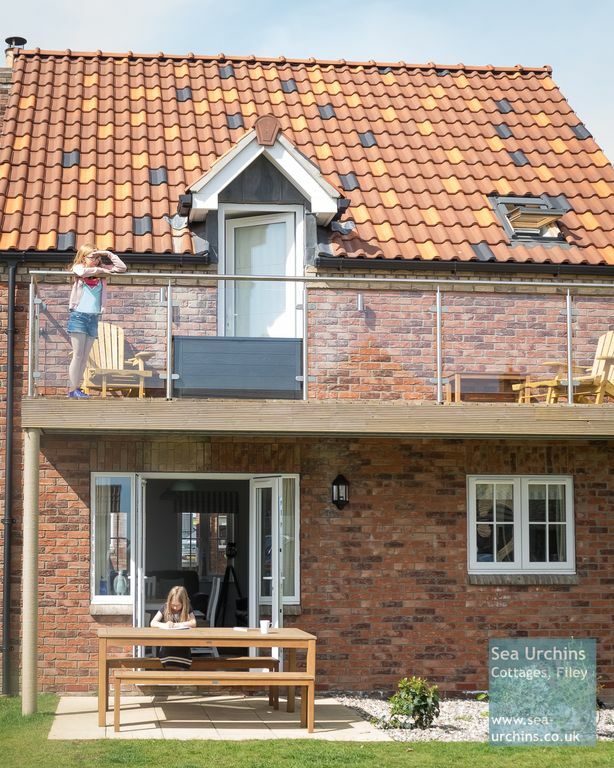 Sea Urchins Cottage is situated on the Bay development, an award-winning holiday park on the Yorkshire coast, with private access down to the beach. The Bay is a great base for those who enjoy sports or outdoor activities - you will have free access to the large heated indoor pool, toddler pool, sauna/steam room and gym. There's also a small playground, football pitch and boules courts. Other activities are available on site for a small charge - archery, fencing, beauty treatments/massage, table tennis, tennis, putting green, aqua-aerobics and other pool activities. The site has a fishing lake, wild meadows and ponds for nature lovers. The Bay also offer bikes for hire, and other seasonal activities (e.g. lake kayaking). On site there is also a public house, cafe/restaurant, pharmacy (selling a few basic groceries), and a new Family Entertainment Centre (amusements). We are Paula and Tim Foster. We live in Sheffield, South Yorkshire. We have 3 school age children, and love visiting Filey - the children love it too and have their favourite shops, cafes, and ice-cream stalls, as do we! We regularly visit "the Bay" - staying in our first holiday home (Sea Urchins beach house ref 8162520) which we have owned since March 2014. We've owned the Cottage since September 2016, and I (Paula) now manage both properties. We love visiting the Bay - staying in our first holiday home (Sea Urchins beach house ref 8162520) every couple of months. On one visit, we found out they were building some homes with balconies and sea views, and we just had to have one as its always been a dream to have a view of the sea and Filey in the distance! We were first introduced to the resort of Filey around 9 years ago and we have holidayed there nearly every year since. The beach is excellent - clean, sandy and not too crowded. We have spent many happy days building sandcastles, paddling in the sea and playing beach cricket. The town of Filey has a variety of small shops and cafés, and glen gardens park is excellent for children. We like the fact you can walk easily from one end of Filey to the other, down to the harbour to watch the fishing boats and play in the arcades, or up into the country park to get some great views. We have our favourite places to visit - Sewerby Hall (with a small zoo), Bempton cliffs RSPB, Flamborough, Scarborough and Whitby (including the steam railway to Pickering). All within a short drive. We now stay at either property when we visit, and make them available to others when we are not there. The Cottage has the benefit of both bedrooms being ensuite for extra privacy, and the second bedroom can be made up for children or adults as it has a zip and link bed. As we are a family of 5, we have a further camp bed, as we appreciate the difficulties in finding holidays when you are not a family of 4! The master bedroom has a full width balcony with seating to take in the sea view to the front and side. The downstairs is open plan, great for family time, and the kitchen has all the mod-cons (dishwasher, washer-dryer, microwave etc). The Cottage is also very close (one of the closest) to the path down to the beach, making it really easy to explore the beach. It is also only a few minutes walk to the resort centre where there is a pool, pub and cafe. There are no passing cars (apart from those staying at the final few properties before the beach road) which makes it quiet in terms of road traffic, but you can sit and watch people passing on their walk to the beach. Central heating with thermostat in hallway. Hand towels in each bathroom and bath towel per guest. Free use of the village gym which includes treadmills, bikes, steppers, weight machines and free weights. Log burner- please bring your own logs, kindling and firelighters and ensure you follow the instructions provided. Dining table with 5 chairs and high chair for baby if required. Open plan to kitchen and lounge. Digital radio in kitchen area. Small selection of books (adult and children) provided. Available in the John Paul Jones pub. Communal lawn at rear of the house. Full width balcony, accessible via master suite. Bistro table with 4 chairs, plus 2 reclining wooden armchairs. Patio at the rear of the house, beneath the balcony. Seating for 6. £5 per half hour court hire- rackets/balls also provided free of charge by leisure staff. Sauna and steam room available on the poolside. 20m heated indoor pool in the leisure complex. Also a small toddler pool. A perfect getaway for families, couples and friends. Room for up to 5 (plus baby). Dogs welcome - up to two well-behaved dogs (maybe more if small) welcome with prior agreement. Wifi available. Non-smoking throughout. The property is set within almost 90 acres of beautifully landscaped parkland, including children's play area, football pitch, wildflower meadow, fishing lake, putting green, tennis court. There is a pub, cafe and shop/pharmacy on site. Private road down to the beach. Free use of heated indoor pool, sauna, steam room and gym. Linens, towels, tea-towel and welcome pack all provided for your arrival. The property is professionally cleaned before and after your stay. A beautiful cottage lovely and clean, has everything you need. The location is great , sits right next to the beach path. We all loved it. A fab break once again! A lovely holiday home which has one of the best views of Filey Brigg you could wish for! Even if the weather isn't great you can still sit out on the balcony and watch the world go by. The cottage is well kept and situated very near the path to the beach, pub and pool which is ideal if you have children. Each bedroom has an ensuite along with a cloakroom downstairs. Plenty of space throughout. We'll definitely be booking again! Lovely presented property with everything we needed for great stay. Great position, lovely site. Maybe short of a grocery shop. Very well appointed, although there were a few issues with dog hairs, and legs were unstable on outside patio furniture. 5-10 minutes walk to the sandy beach which stretches for miles, and is suitable for swimming and body-boarding. Sea Urchins Cottage will welcome its first guests in October 2016. If you have any questions which we haven't covered in the description, please do email us.